Photo courtesy of Chicago Red Stars/Daniel Bartel. 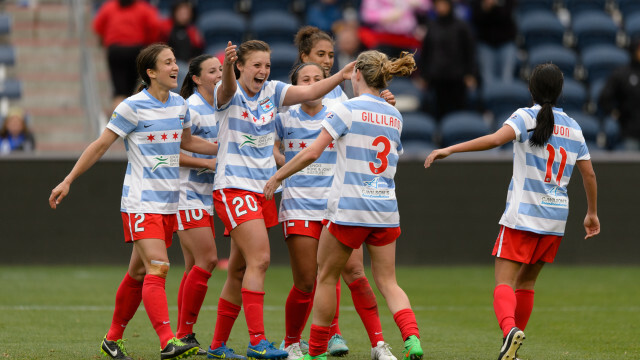 The Chicago Red Stars defeated the Houston Dash, 2-0, at Toyota Park in Bridgeview, Illinois, to improve to 2-2-0 in the National Women’s Soccer League (NWSL). The Houston Dash fall to 2-2-0. A soft back pass by the Dash almost cost them early. In the 5th minute, Danielle Colaprico intercepted Janine Beckie’s back pass and laid the ball off to Julie Ertz, who made a run into the box and got off a left-footed shot to the lower far post that was inches wide. Houston struck first but unfortunately it was an own goal just before halftime. Colaprico served a right-footed cross into the box off a free kick that hit Dash forward Sarah Hagen on the head and right passed goalkeeper Lydia Williams. Julie Ertz continued her move to a defensive midfield role in the Red Stars’ 4-4-2 formation, and it is, so far, paying dividends — Ertz scored her second goal of the season in the 61st minute. Christen Press got the end line and sent in a cross from the right that Colaprico got a foot on. Ertz was there on the rebound and sent a left-footed strike that Williams was unable to get a hand on. Morgan Brian saw her first minutes of the season for the Dash when she came on in the 71st minute. The Dash looked more organized and energized with Brian’s presence on the field. In a give-and-go, Brian found Beckie making a run into the box on the right in the 74th minute and Beckie’s cross almost snuck past Naeher but sailed over the crossbar. Chicago’s Alyssa Naeher made a late save to earn the shutout by pushing substitute Nichelle Prince’s right-footed shot wide. Statistics for the teams was fairly even: Chicago held 50.1% of the possession and got 10 shots off with 3 on frame while Houston maintained 49.9% in possession and shot 9 times, with 2 shots on target. Chicago will host the Boston Breakers on Sunday, May 14 while Houston ends its three-game road trip and returns home to face Sky Blue FC.